Few new technologies have raised as much discussion as blockchain. One reason is the controversy, concern, and perceived opportunity around blockchain-based cryptocurrencies (such as bitcoin and ether) and crowdfunding via initial coin offerings (ICOs). But what is blockchain’s role in the enterprise? This article gives some ideas to think about. Take those trends with grain of salt. 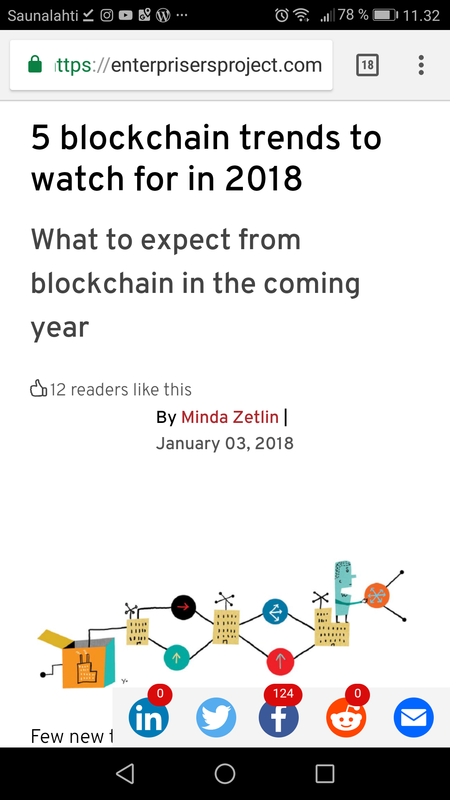 There will be a crash ans bubble burst on blockchains in few years. Ultimately, an attacker could have exploited the vulnerability to mint an infinite amount of counterfeit Zcash—as well as any other cryptocurrency that relied on its cryptographic technology—and no one would have been the wiser. In one instance, email correspondence obtained by CoinDesk shows an OTC trader based in Latin America had his account closed after he informed Gemini that he planned to redeem several million dollars of GUSD. According to the trader based in Latin America, Gemini pitched the company on a discount deal that offered his firm the ability to buy tokens at below market value. How blockchains work and how to secure them. Maybe he faked his death and ran off with the money? Amber Authenticate is a new tool built on Ethereum that generates hashes of a video and records them on a public blockchain to protect it from deepfakes — VIDEO HAS BECOME an increasingly crucial tool for law enforcement, whether it comes from security cameras, police-worn body cameras, a bystander’s smartphone, or another source. Engineers at the lender have created the “JPM Coin,” a digital token that will be used to instantly settle transactions between clients of its wholesale payments business. While J.P. Morgan’s Jamie Dimon has bashed bitcoin as a “fraud,” the bank chief and his managers have consistently said blockchain and regulated digital currencies held promise. Blockchain has the potential to solve 3D printing’s inherent security risks before they become a major issue. If you’ve never heard of such a thing for 3D printing that’s okay, because Heslin said such a thing really doesn’t exist. “The [3D printing] process is linear, but it’s not single or seamless,” he said. the source code to produce 3D-printed parts can be stolen by recording the sounds the printer makes. So how does blockchain address all of this? Blockchain works by creating a distributed, encrypted ledger across any number of parties that can be used to verify not only identities but also the status of any particular job. That means every entity involved in any stage of a 3D print is aware of what all the others are doing at any time in a safe and secure manner. Since a blockchain is decentralized, meaning no single entity owns it, stealing or altering a 3D printed file from a blockchain is not about tricking a single computer or printer – you’d have to hack every entity that was a part of that particular chain, which is exponentially more difficult, if not sometimes impossible. Coinbase plans to add XRP, one of the world’s most controversial cryptocurrencies, to the list of virtual coins traded on its exchange, the company said Monday. XRP is a digital asset tied to a blockchain ledger that’s used for cross-border payments. The virtual coin has provoked controversy for its tangled history with Ripple, a startup that owns the vast majority of XRP—a stockpile worth billions of dollars—in reserve. SoFi says it will launch cryptocurrency trading in partnership with Coinbase in Q2 and also has plans for zero-fee SoFi-branded ETFs and a credit card in 2019 — – The online lending start-up will launch cryptocurrency trading in the second quarter of this year. Coinomi wallet bug sends users’ secret passphrases to Google’s Spellcheck API via HTTP, in plaintext. The Coinomi wallet app sends user passwords to Google’s spellchecking service in clear text, exposing users’ accounts and their funds to man-in-the-middle (MitM) attacks during which attackers can log passwords and later empty accounts. Al Maawali says that during the Coinomi wallet setup, when users select a password (passphrase), the Coinomi app grabs the user’s input inside the passphrase textbox and silently sends it to Google’s Spellcheck API service. Al Maawali says that just like any other Chromium-based app, it comes integrated with various Google-centered features, such as the automatic spellcheck feature for all user input text boxes. The issue appears to be that the Coinomi team did not bother to disable this feature in their wallet’s UI code, leading to a situation where all their users’ passwords are leaking via HTTP during the setup process. Some of the world’s biggest internet messaging companies are hoping to succeed where cryptocurrency start-ups have failed by introducing mainstream consumers to the alternative world of digital coins. Telegram, which has an estimated 300 million users worldwide, is also working on a digital coin. Coinbase’s acquisition of Neutrino, co-founded by the key people behind the controversial hacking tools vendor Hacking Team, sparks a #DeleteCoinbase campaign — Users trying to #DeleteCoinbase are having trouble after the exchange acquired a startup staffed by former Hacking Team members. Users of Coinbase, a major exchange for buying and selling Bitcoin and other cryptocurrencies, are having trouble closing their accounts in protest after the platform acquired a startup founded by former members of a highly controversial Italian hacking tool vendor. Coinbase announced its acquisition of Neutrino, a startup that traces cryptocurrency transactions, last week. Neutrino’s key staff are former members of Hacking Team, which sold surveillance and intrusion tools to international governments with dubious human rights records. The acquisition was met with widespread condemnation in the cryptocurrency community, which kicked off a hashtag—#DeleteCoinbase—aimed at fomenting a groundswell of account closures in protest. To close a Coinbase account, you have to have a balance of zero. Some users with infinitesimal fractions of cryptocurrency called “dust” in their accounts, which are usually leftovers from various transactions, were reportedly met with an error message when they tired to send these small amounts to an external wallet, saying the amount was too small to send. To get around this limitation, users are sending their dust to other Coinbase users before closing their accounts. Some users are reporting issues closing their Coinbase accounts even after transferring all of the dust out. Civil is a community-owned platform for independent journalism founded to advance trust and sustainability for journalism worldwide. The community members are news organizations and you, the public they serve. We founded Civil to make an impact on the world using decentralization and network effects to create an alternative model to support journalism and the information needs of citizens. We’re looking for citizens who want to support a new model for journalism and who want to help run the platform where they get their news. That’s why members will also receive an equivalent number of Civil tokens relative to their financial contribution to the Civil Foundation. You can use Civil tokens to vote and challenge unethical newsrooms on the Civil Registry. All newsrooms on Civil have to sign and abide by the Civil Constitution, which was developed in consultation with journalists, academics and ethicists all over the world, in order to remain in good-standing on the Civil Registry and continue publishing on the Civil platform. There will only ever be one hundred million Civil tokens in existence (thanks, blockchain! ), and the Civil Registry ensures that the value of Civil tokens will forever be tied most directly to the health and scale of the community network. Gerald Cotten, the founder of QuadrigaCX, was thought to have had sole access to the funds and coins exchanged on it. After his death in December, his colleagues said that about $137 million in cryptocurrency belonging to about 115,000 customers was held offline in “cold storage” and inaccessible. the accounts were emptied in April, eight months before his death, it said in a report last week. Quadriga kept “limited books and records” and never reported its financials. Burdened with $190 million in debt and unable to find or access the money, Quadriga filed for creditor protection in late January. The cold wallets of QuadrigaCX, once the largest crypto exchange of Canada, have reportedly been found to be empty. According to Bloomberg, most of the Bitcoin funds from the exchange’s cold wallets were moved out in April 2018, more than 9 months before QuadrigaCX revealed it had lost $150 million in customer funds after its CEO Gerald Cotten passed away with sole control of the company’s wallets. This marks the latest twist for a Vancouver-based digital exchange that shuttered operations at the end of January, leaving 115,000 customers out-of-pocket for about C$260 million in cash and cryptocurrencies. The firm has been under court-approved creditor protection since Feb. 5 and Ernst & Young has been sorting through Quadriga’s dealings as a monitor under the process. Cotten died on December 9 in Jaipur, India, where he was opening an orphanage, due to complications from Crohn’s disease. At least this is what QuadrigaCX said in a statement on Facebook on January 14. The condition is painful and life-changing but it is rarely fatal. Fortis Escorts, a private hospital in Jaipur, has released details of Cotten’s death stating that he suffered from septic shock and other serious issues relating to his condition. He suffered two cardiac arrests, the second of which was fatal. Nic Carter allowed that Bitcoin’s fixed money supply might become a liability. Jeremy Welch, CEO of Casa, acknowledged that Lightning is not going to solve all of Bitcoin’s problems. The decentralized ledger technology isn’t just for cryptocurrencies anymore. Throughout the history of the semiconductor industry, disruptive IC technologies have been brainstormed and developed by innovative thinkers, offered up for global consideration through technical papers and conferences, discussed and scrutinized, put to the test at alpha and beta sites, and – once proven – adopted for widespread use. The path is similar for inventive applications. Blockchain is one such advancement that is gaining momentum. This 11-year-old means of enabling the secure distribution of data for digital transactions has its roots in cryptocurrency. Two specific characteristics of blockchain – its ability to serve as a decentralized ledger and the way that it protects any entered data from being modified – make it appealing to businesses. It can be used to efficiently record transactions between two parties in a way that is both verifiable and permanent, which could make this technology a key asset in battling identity theft and online fraud. At its heart, blockchain is a list of ‘blocks’ of digital information – any information – that is not stored in one place, but copied to computers in numerous different places. In principle, information stored in this way is accessible to anyone, and is also harder to corrupt, because corruption would need to occur simultaneously in a majority of the identical copies. Many people see bitcoin and other applications of blockchain as a freer, more egalitarian and more secure way of running services such as banking. Kałuża adds that the annual cost of servicing a current account is €100, which banks try to reclaim from customers one way or another. According to a 2016 study by the Polish central bank, only 9% of under-18s have a bank account. ‘From the end user’s point of view there is not much difference between Billon’s solution and a standard bank account,’ says Kałuża. Billon will ultimately make money from the platform by licensing it to banks and other service providers, such as utility companies. Unlike existing institutions, many blockchain applications aim to be accessible to everyone equally – but that sacrifices centralised oversight. ‘The question is not blockchain per se – blockchain is a wonderful technology,’ he continued. But, he says, there is an open question about what happens when blockchain challenges the power of the law and the power of existing institutions. Cosmos, a highly anticipated blockchain designed to provide interoperability between other blockchains like Bitcoin and Ethereum, goes live — Cosmos, a highly anticipated blockchain itself designed to improve the interoperability between any number of other blockchains, has officially released a live software. It is simply a double SHA256 hash (hashing the output again) over the block header, a 80 byte sequence containing the version, previous block hash, merkle root (verifies the transactions), time, current difficulty and nonce. The miner searches for a hash that is smaller than the difficulty value, that is why you can see that all all block hashes in the chain start with multiple zero bytes. To generate different inputs they vary the nonce value (and maybe time).